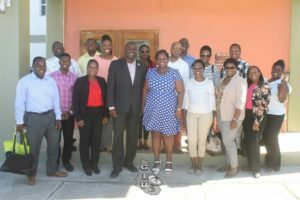 Staff members of the Ministry of Foreign Affairs and Aviation journeyed to the neighbouring island of Montserrat on a one-day familiarization visit Dec. 13 geared toward promoting greater understanding between the people of Montserrat and St. Kitts and Nevis. The delegation, headed by Permanent Secretary Kaye Bass, paid a courtesy call on Deputy Premier the Honourable Delmaude Ryan, and the Honourable Gregory Willock, acting minister of communications, works, energy and labour. In welcoming the delegation, Minister Ryan expressed her delight in facilitating the visit as it provided an opportunity to gain first-hand knowledge of Montserrat, given its challenges in the wake of the volcanic eruption more than two decades ago. She also invited the visitors to view Montserrat as a friendly environment, ready to facilitate business opportunities in spite of the difficulties it continues to face. She added that the volcanic eruption itself provided valuable mineral resources for the construction and health and beauty industries. Permanent Secretary Bass regarded the visit as a means of strengthening relations between St. Kitts and Nevis and Montserrat, and exchanged views with the two cabinet members on functional cooperation among small states, the impact of Brexit on the Montserrat economy, trade and investment opportunities, and climate change. The delegation also had a brief opportunity to meet and greet Premier Donaldson Romeo on his return from a scheduled meeting and took a group photo with the premier and deputy premier. The delegation benefited from site visits to government offices, including the offices of the deputy governor, customs and excise, fire and rescue services, police headquarters, and the Ministry of Communications and Works; and an island tour with scheduled stops at the Montserrat Volcano Observatory overlooking the capital Plymouth, Quarry Sites and Runaway Ghaut. Montserrat is a full member of the Caribbean Community (CARICOM) and the Organisation of Eastern Caribbean States (OECS); however, it does not participate in the CSME or the Economic Union specific regime on the free movement of people embodied in both regional projects.